Now when I type Poll.b, I have to type 'ctrl-space' to get the auto complete to pop up. Attached is a screenshot of my Code Completion preferences. How do I get back my auto complete as I type without hitting ctrl-space? Thank you! Your settings are correct for the behavior that you need. In the cases when you see the problem, is the Poll class declared in the same file, or is it imported from another module? It doesn't work if the Poll class is declared in the same file or from another module. However, it will always show up if I hit ctrl-space whether or not it's in the same file or another module. The problem occurs on old and new projects. NOTHING will show up for the auto complete box, for any object in my code (import modules, class definitions, variables, etc), UNLESS I hit 'ctrl-space (in which case it works as normal). I did notice that when I reinstalled (after uninstalling the app and library files), the first time I reopened Pycharm it still had my theme and recent file list settings saved. What is the most sure way to remove ALL Pycharm application settings so I can try reinstalling again? Hi, I'm still unable to get this to work properly and haven't heard back any response. 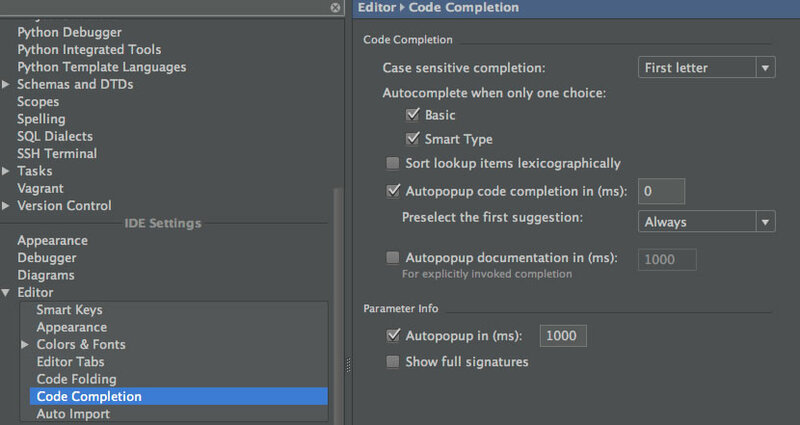 Autocomplete was one of the main reasons I purchased Pycharm. What more can I do to help support diagnose this problem? It's absolutely ridiculous that I can't receive a response on how to fix this. It's been almost a month and a half. I've given every bit of information that you guys have asked. I've even raised a ticket and recevied no feedback.